Editor’s note: This week the Google team is in Philadelphia for the annual EDUCAUSE conference, a gathering of higher education technology leaders. If you’re at the event, visit us at booth #1100 to see the latest demos of Google Cloud Platform (GCP), G Suite, Jamboard, as well as virtual reality and augmented reality tools. Or follow the action on our @GoogleForEdu account, using the #EDU17 hashtag. If you want to connect with our team but can’t make it to Philadelphia, contact us. I’m continually inspired by all the ways that educational institutions use Google Cloud to expand learning for everyone. 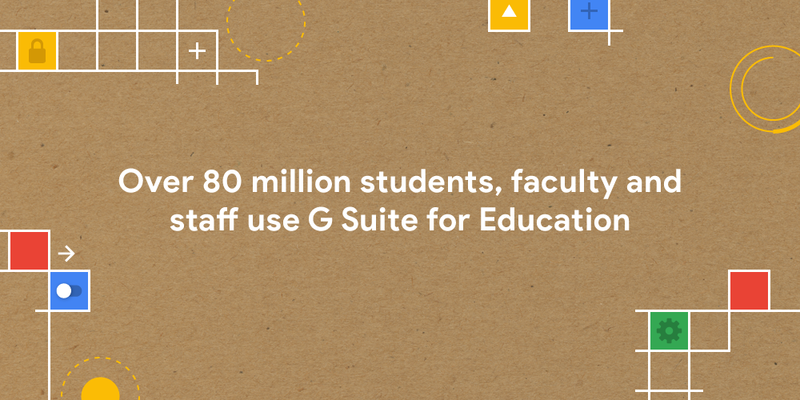 Today, eleven years after San Jose City College and Arizona State University became the first to adopt G Suite for Education, we’re announcing that more than 80 million students, faculty and staff now use these tools in higher ed and K12.. Meanwhile, Google Cloud’s product portfolio continues to expand, helping us keep up with educators’ and students’ limitless ideas. Below are a few recent highlights of what institutions have been doing with the help of Google Cloud. Amidst the spread of the Zika virus, the Modeling of Biological and Socio-technical Systems (MoBS) lab at Northeastern University, created a model to better understand the deadly virus. Using a mathematical and computational approach powered by GCP, the team studied different scenarios under which Zika could spread, projecting its impact on affected populations. The model is based on the initial spread of Zika in Brazil, and allows researchers to predict the impact of new infections in other locations by introducing additional data layers, including temperature, number of mosquitoes, population size and people’s travel patterns. 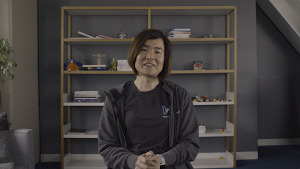 With Google Compute Engine and Preemptible Virtual Machines, MoBS has run more than 10 million simulations and drastically reduced the time needed to analyze data. “Time is vital when confronting disease outbreaks,” says Matteo Chinazzi, Associate Research Scientist at Northeastern University, “and GCP gives us the tools we need to move quickly at scale.” To read more about MoBS Lab’s Zika research and analysis, check out “Spread of Zika virus in the Americas” and our full Northeastern case study. This incidence map of Zika infections, created in December 2016 by the MoBS lab simulation model, is a spatial projection of the median number of infections by February 28, 2017. The inset maps provide detailed projections for the areas of Recife and Belo Horizonte, Brazil. 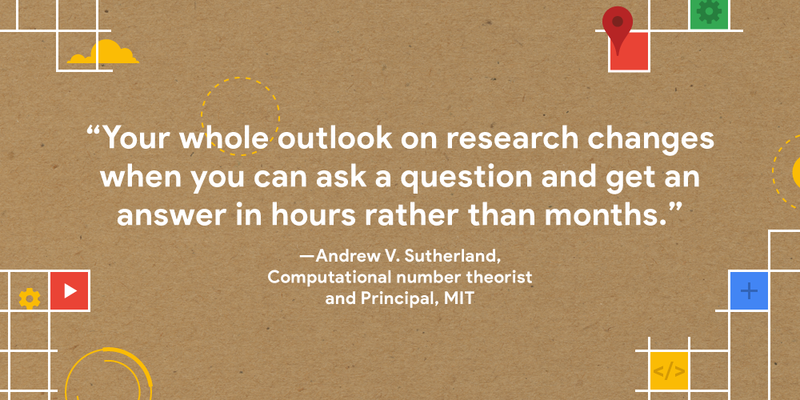 Andrew V. Sutherland, a computational number theorist and Principal at the Massachusetts Institute of Technology (MIT), is part of the team behind L-Functions and Modular Forms Database (LMFDB), a detailed atlas of mathematical objects and the connections among them. This database is used by physics, computer science and mathematics communities around the world. The calculations to create the objects in LMFDB are complex, time-consuming and expensive to perform. Sutherland uses Compute Engine and Persistent Disk to calculate some of those objects. One tabulation required 580,000 cores of preemptible VMs to compute—the largest known high-performance compute cluster to ever run in the public cloud. LMFDB also uses Google Cloud to host its web servers, as well as GCP tools like Google Stackdriver, Google Cloud Console and Google Cloud Load Balancing. Running on GCP supports countless daily searches, and allows people in multiple countries to easily administer the system. We’re excited to see how the team behind LMFDB continues to push the limits of what is possible. See the full MIT LMFDB case study. GCP Education Grants are putting the cloud in the hands of future researchers and computer scientists at more than 500 higher education institutions. 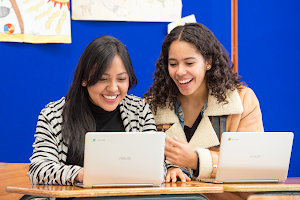 At City College of New York (CCNY), GCP Education Grants provide computer science (CS) students with hands-on experience with virtualization, containers and other cloud technologies. Peter Barnett, Adjunct Associate Computer Science professor, uses GCP Education Grants for students in his Senior Project capstone course, whose software projects have great scientific, social and entrepreneurial potential. These students think big, and the GCP grants can help them move from big ideas to new creations. Across the country, Gloria Washington, a computer science professor from Howard University, helped students in her summer course at Howard West in Mountain View tackle machine learning problems using Cloud Datalab and TensorFlow. These tools allowed Gloria to design a course that was hands-on and project-based, helping students focus on machine learning rather than spending all their time setting up the technology. Professors teaching courses in computer science and related fields can apply for free GCP Education Grants. Learn more about eligibility and apply for grants and see the full case studies about the experiences of Howard West and CCNY.